Last week I attended a wonderful conference dedicated to better thinking about thinking. During a break between sessions, I made use of the hotel restroom and while washing up, I experienced a moment that I can only describe as brain freeze induced enlightenment. As I walked up to the sink, I passed by, and apparently activated an automatic paper towel dispenser, which sensing my presence, issued a sheet of paper for my use. Now facing the sink, I absent-mindedly waived my right hand under the automatic soap dispenser, and was obligingly offered a dollop of liquid soap. However, as I gently waived my left hand under the faucet to initiate the flow of water, nothing happened! I waived my hand a bit more vigorously, but still no water. I then realized, to my great embarrassment, that the faucet was not automatic, and had instead, manual hot and cold valves. Those shinny, chrome plated valves seemed to stare at me, mocking my unrewarded hand waiving behavior. After a quick glance over my shoulder to ensure that no one else had witnessed my brain freeze, I turned on the hand valves and received the water that allowed me to complete my hand-washing mission. Walking back to the conference session area, I reflected on what I’d just experienced. I smiled as I considered the irony of my thought lapse, occurring as it did, during a conference dedicated to better thinking. However, the experience also made me think about how today’s consumer technologies are stealthily reshaping our everyday behaviors and creating habits that stop us from using our senses and our brains. Here are just a few of the technologies and associated emerging habits that put us at risk. • Your car is equipped with a rear facing video camera that’s activated when the shifter is placed in reverse. Have you noticed that when you back up your car, you’re not looking over your shoulder as much as you used to do? Maybe not even looking in the rear-view mirror as much as you used to do? • Automated Doors. Have you ever seen anyone waving his or her arms in front of a manually opened door, and getting frustrated because it’s not opening? I have. When the person I observed realized the door wouldn’t respond to their movements, rather than stepping forward and pulling or pushing it open, chose to move to another adjacent door that was automatic. • Digital Reading Devices. Will the proliferation of these devices cause us to forget that when reading a real paper book, tapping the right hand margin with your finger won’t result in the page turning? • Telephone Caller ID. Will we become so selective about who we choose to actually speak with, that we’ll never speak with a stranger again? • Telephone Texting. As more of us do more and more texting with cryptic shorthand, will we bring those habits into our other communications and stop using real words and complete sentences there as well? These are but a few of the habits we’re collectively adopting everyday, as we become accustomed to, and reliant on, the advantages of new technologies. 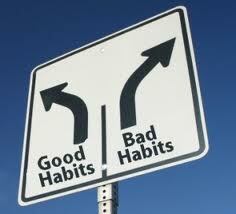 We are by nature, creatures of habit, both good and bad. In fact, we need habits to survive. So I guess it’s good that the relentless development and deployment of consumer technologies will ensure that we will not only be better connected, better informed, and more productive, but that we will also always have an endless supply of new and innovative habits.